When I designed the new School Analytics system I was keen to incorporate a measure of progress into my new assessment manager marksheets. Even in the brave new world of assessment without levels, teachers tell me that they still need a measure of progress for the termly (or half termly) summative assessments. Notice that I’ve chosen to credit the ‘mastered’ grades with a full point of progress from the ‘secure’ grade. Feedback from the all schools I spoke to would rather the pupil (and the pupil’s teacher!) to be credited with a grade of progress – this is different Capita and other suppliers approaches which effectively assign the mastered grade the same value as the secure grade. I’ve also included P-Scales. I chose to include P-Scales because many schools have lots of SEN pupils who need to be included in progress measures. 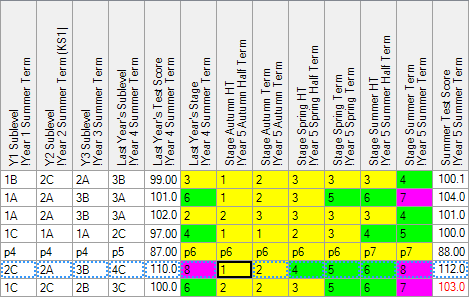 As yet, there seems to be no definitive guidance for schools on the values of P-Scales relative to the lower age related expectations (ELG, 1E,1D etc) so I chose values for the p-scales purely based on feedback from my schools. The same applies to ages and stages in nursery and reception. Again, the values in the School Analytics system are purely based on feedback from schools, not on any DfE guidance. I chose to extend the range provided by Capita and have included the 22, 16 and 8 month categories as well as the 40-60 and 30-50 categories provided by Capita. Why is this important? Indeed, should we still measure pupil progress in such an apparently crude way? Many assessment gurus argue that measuring progress like this was one of the faults of the system of levels and sub levels. I put this argument to many of the schools that I’ve worked with over the past 18 months but every school has maintained some kind of points based progress measure. Why have old-fashioned progress measures like this remained popular? I think because senior leadership teams genuinely need a whole-school, top-down measure that they can articulate to governors, school improvement professionals and Ofsted. Thanks to systems like Capita’s Programme of Study marksheets, schools are now much more focused on formative assessment. They can more easily identify exactly what each pupil needs to understand better to make progress. The focus on formative assessment ensures that we can no longer misuse progress points. Instead they need to be used carefully and in the context of more detailed formative assessment.